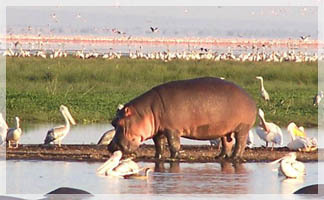 Tour 1 - 3 Days Ngorongoro/ lake Manyara lodge tours. Leave Arusha in the morning and proceed to Ngorongoro arriving in time for lunch. Afternoon game drive. Dinner and overnight at Ngorongoro Sopa Lodge. All meals included. The Ngorongoro Crater is often called ‘Africa’s Eden’ and the ‘8th Natural Wonder of the World,’ a visit to the crater is a main draw card for tourists coming to Tanzania and a definite world-class attraction. The Ngorongoro Conservation Area (NCA) is home of Ngorongoro Crater. It was formed some 2.5 million years ago from a volcanic mountain sinking due to inactivity, and was initially thought to be higher than Tanzania’s famous Kilimanjaro. The crater has evolved into a unique and integral part of Tanzania’s eco-system. The crater is actually a caldera, measures 22.5 km’s across and the rim walls stand 600m high. Views from within and from the rim are breathtaking (as can be seen from the picture). The crater houses 30,000 animals, and a large variety of birds, which rarely move from the area due to the availability of water through wet and dry seasons. After breakfast leave with picnic lunch for Lake Manyara, afternoon game drive.Dinner and overnight at Lake Manyara Serena. All meals included. Pick up from the hotel in Arusha and transfer to Ngorongoro, en route game viewing, half a day game drive on the crater rim. 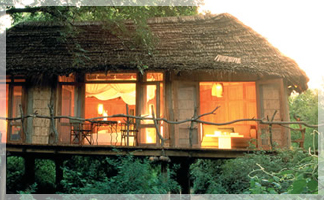 Late afternoon game drive then we bring you to the Ngorongoro Sopa Lodge on the crater rim for dinner and overnight. This is a short wildlife safari. Tarangire has the largest concentration of wildlife mainly in dry seasons eg August and May, there are over 300 species of birds recorded. 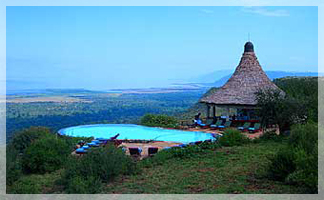 Then proceed to the scenic Ngorongoro and tree climbing lions in L. Manyara. Depart Arusha in the morning for Lake Manyara, arriving there by lunch time. Afternoon game drive. Dinner and overnight at Lake Manyara Serena. Located beneath the cliffs of the Manyara Escarpment, on the edge of the Rift Valley, Lake Manyara National Park offers varied ecosystems, incredible bird life, and breathtaking views. Lake Manyara’s famous tree-climbing lions are another reason to pay this park a visit. The only kind of their species in the world, they make the ancient mahogany and elegant acacias their home during the rainy season, and are a well-known but rather rare feature of the northern park. In addition to the lions, the national park is also home to the largest concentration of baboons anywhere in the world -- a fact that makes for interesting game viewing of large families of the primates. After early breakfast, depart for Ngorongoro crater, en route game viewing, half a day game drive on the crater rim. Late afternoon drive to Ngorongoro Sopa Lodge on the crater rim for dinner and overnight. The Ngorongoro Crater is often called ‘Africa’s Eden’ and the ‘8th Natural Wonder of the World,’ a visit to the crater is a main drawcard for tourists coming to Tanzania and a definite world-class attraction. The Ngorongoro Conservation Area (NCA) is home of Ngorongoro Crater. It was formed some 2.5 million years ago from a volcanic mountain sinking due to inactivity, and was initially thought to be higher than Tanzania’s famous Kilimanjaro. The crater has evolved into a unique and integral part of Tanzania’s eco-system. The crater is actually a caldera, measures 22.5 km’s across and the rim walls stand 600m high. Views from within and from the rim are breathtaking (as can be seen from the picture). The crater houses 30,000 animals and a large variety of birds, which rarely move from the area due to the availability of water through wet and dry seasons. After breakfast drive to Tarangire. 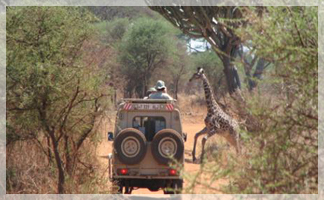 Afternoon game drive, meals and overnight at Tarangire Safari Lodge. Tarangire National Park, one of the hidden jewels of Tanzania. This park measures 2,600 sq km’s and boasts a concentration of wildlife second only to Ngorongoro Crater. It features an impressive amount and array of bird life and plant life. Situated only 160km’s from Arusha, the park is nestled to the south of the large open grass plains of southern Maasai land. It is named after the Tarangire River, which runs directly through the center of the park and is the only permanent water source for the animals. Along the banks of this river you will find herds of wildebeest (or gnu) and zebra, followed by Grant’s gazelle, Thomson’s gazelle and many others. Lurking in the background lion and leopard keep a watchful eye on a possible meal. The park offers views of grass and floodplains with impressive baobab and flat topped acacia trees scattered throughout. During the dry season the park may look quite ordinary, but activities continue even more earnestly due to the now increased competition. After breakfast enjoy a morning game viewing drive in the Tarangire National Park. Return to lodge for lunch and in the afternoon depart for Arusha. Depart Arusha in the morning for Lake Manyara. Afternoon game drive , dinner and overnight at Lake Manyara Serena Lodge. After breakfast depart for Serengeti passing through Olduvai Gorge, the site of Leakey’s family discovery of fossils of human and animal ancestors dating back to almost two million years. Meals and overnight at Serengeti Sopa Lodge. Full day in Serengeti plains in search for wild game you might have missed the previous game drive. Morning and afternoon game drives. Meals and overnight at Serengeti Sopa Lodge. Serengeti is easily Tanzanias most famous national park, and it’s also the largest, at 14,763 square kilometres of protected area that borders Kenya’s Masai Mara Game ParkIt is the Migration for which Serengeti is perhaps most famous. Over a million wildebeest and about 200,000 zebras flow south from the northern hills to the southern plains for the short rains every October and November, and then swirl west and north after the long rains in April, May and June. So strong is the ancient instinct to move that no drought, gorge or crocodile infested river can hold them back. The Wildebeest travel through a variety of parks, reserves and protected areas and through a variety of habitat. Join us to explore the different forms of vegetation and landscapes of the Serengeti ecosystem and meet some of their most fascinating inhabitants. After breakfast a 4wheel drive vehicle will take you 2000ft down to the crater, enjoy picnic lunch at the crater, ascend back to Ngorongoro Sopa Lodge for dinner and overnight. Pick up from your hotel at 0800 hrs and drive to Lake Manyara National park to arrive in good time for lunch at Lake Manyara Serena Lodge . Proceed for afternoon game drives . Dinner and overnight Lake Manyara Serena lodge. Early morning game drives then return to the lodge for breakfast .Depart the lodge and proceed Serengeti passing through Olduvai Gorge, the archeological site of the Leakey family. 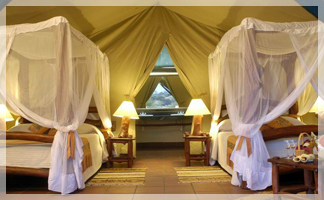 Meals and overnight at Serena Lodge.,sopa Lodge or Tented camps. A full day with morning and afternoon game drives to explore the plains, Dinner and overnight at Serengeti serena ,sopa Lodge or Tented camps. Breakfast at leisure then view game as you drive to Ngorongoro conservation area for overnight stay at Ngorongoro Serena or Sopa Lodge. After early morning breakfast leave with picnic lunch for a full day crater tour. You will be taken 2000ft down the crater by a 4wheel drive vehicle, explore the crater before ascending and proceeding to Tarangire Sopa lodge or Tarangire River lodge for dinner and overnight stay. Early breakfast then proceed for morning game drives at Tarangire National park - return to the lodge for lunch - drive to Arusha to arrive by 1600hrs where the safari ends. Serengeti is Tanzania largest and most famous national park with the wildebeest migration expected in December and May, Tree climbing lions and birdlife in lake manyara and finally a tour to the worlds most visited destination (Ngorongoro) famous for high wildlife concentration and breath taking sceneries-more days spent trailing with migration in Serengeti. After breakfast, leave for Lake Manyara National Park for a full day game drive with picnic lunch. Lake Manyara is a birdwatcher's paradise. Marvel at the variety of species, spoonbill, teal, pelican, kingfisher, hornbill and cormorant. In the tall trees, forest monkeys leap from branch to branch on the slope of the Great Rift escarpment, elephants stand in the shade of the baobab; and in the acacia woodland, lions lie draped along the branches of the umbrella trees Dinner and overnight at Lake Manyara Serena Lodge/Lake Manyara Hotel. After breakfast leave Lake Manyara National Park and proceed to Serengeti National Park with picnic lunch, arriving in the afternoon. Take a game drive to this park with immense herds of herbivore, wildebeests, gazelles and Zebras followed by predators on their annual migration to permanent water holes, offering a timeless spectacle unequalled in the world. Dinner and overnight at Serengeti Serena Lodge/Serengeti Sopa Lodge. Morning games drive after breakfast. Enjoy the endless plains of Serengeti with game viewing, A magnificent experience awaits as you travel to the most famous wildlife park in Africa the legendary Serengeti. Here you might have the chance to see the migration, where thousands of zebra and wildebeest make trip from the Masai Mara every year. Packed lunch is served and proceed for an afternoon game drive. Dinner and overnight at the Serengeti Serena Lodge/Serengeti Sopa Lodge. Morning game viewing drives then return to the lodge for breakfast , proceed further game drives as you exit the park and drive to Ngorongoro conservation area via Olduvai gorge - Proceed for dinner and overnight stay at Ngorongoro Sopa Lodge. Descend once again down to the Ngorongoro Crater, one of the wonders of the natural world. An extinct volcano that collapsed around 25 million years ago thus forming a vast super bowl where the largest permanent concentration of African game is on display. The views from the top of the crater wall are absolutely breathtaking which are forested but four wheel drive vehicles will take you down into this primeval paradise of woodland, lake, river, swamp and plain that shelters around 20,000 animals. Large grazing animals such as wildebeest, buffalo, gazelle and zebra that depends on the open grasslands in the crater. Attracting predators, the black-maned lion, the leopard and hyena. The elephant found are the lone males. The Fever Tree forests shelter monkeys, bushbuck and waterbuck and the few black rhino that have taken refuge here. A soda lake attracts water birds, including flamingoes and is a favourite place for predators to make their kill. Wildly beautiful as it is, it is not surprising that Ngorongoro Crater has been called a Garden of Eden. The game drives are done with packed lunch.. Dinner and overnight at the Ngorongoro Serena Lodge/Ngorongoro Sopa Lodge. After breakfast, game drive enroute for Tarangire National Park. In the afternoon you'll be taken on a game drive through the park. 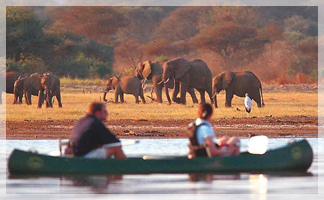 Many of the animals congregate around the only source of permanent water in the park, the Tarangire River. This is the best place in Tanzania to see really big herds of elephants of up to 300 at a time on safari. Dinner and overnight at Tarangire Sopa Lodge/Tarangire Safari Lodge. After breakfast, drive back to Arusha for lunch. Transfer back to the airport to connect with your flight back home.